The phone in my office rang and when I picked up, the voice on the other end said, “Hi, it’s Jesse, I heard you wanted to talk to me.” Yes, in fact, I did want to speak with Jesse James of JJFU (Jesse James Firearms Unlimited). You might recognize the name from his famous motorcycles (West Coast Choppers TV series) or cars (Monster Garage TV series), but our interest was solely based on his seemingly new passion for guns. If you do not know, James started manufacturing firearms (and why not? ), predominantly 1911s and AR-15s, at the end of 2013 in Austin, Texas, and has been going strong ever since. We have been following JJFU since its inception and reached out to our readers to find out what you would want to know, now that James’ shop has been up and running. We took all of your questions and created a great interview. Talking to James was as easy as talking to an old friend. If I didn’t know any better, I would have pictured a teenager with sun-bleached hair who just walked off of the beach in California. I wasn’t too far off, as James hails from Long Beach, but what I didn’t expect was his easy-going and unpretentious nature (this is not what he is known for on set). He was happy to answer my questions, no matter how technical or routine, and seemed eager to share his thoughts on current and future concepts. This is where you start to see the perfectionist and zero tolerance for error, and somehow, this comes through his boyish demeanor. Danielle Breteau What prompted you to start building firearms after so many years of custom motorcycles and cars? Jesse James I’ve spent so much time building bikes that sometimes I feel I’ve done everything I had set out to do with them. I feel like the firearms industry found me about three years ago when I moved to Texas. You know, most gun-smithing is simply knowing how to machine, and I have over 25 years of experience in that field, by hand and with CNC (computer numerical control) machines. It was a natural fit. DB Do you consider firearms to be pieces of art or useful field equipment? JJ It took a while to consider myself as an artist. I think most people would find firearms to be art or art-like; I certainly think so, and I love the lines. Also, there is art to tailor-making everything by hand, the details of the fit and finish. That is what is important to me. DB Who are your clients? JJ Anyone from operators to lawyers. It seems to be a pretty wide swath of people who are interested, but when I was at the SHOT (Shooting Hunting and Outdoor Trade) Show this year, there were a lot of people who told me they didn’t even know I made firearms. We haven’t advertised yet, so far everything has been by word of mouth. DB Do you compete in any type of shooting competitions? JJ No. All that running around does not look like something I want to do. I shoot at my range (the one at his house) and I think I can shoot pretty well. JJ No, but I think I could. Not a trophy hunt, but maybe small game, like a turkey, but it would have to be respectful to the animal, like the way the American Indians hunted and took only what they needed. Overall, though, it is not my cup of tea. DB Any thoughts on creating other guns, like a shotgun or precision rifle? JJ F&N has a great long-range .50 bolt-action rifle, but when I think of building my own, I would have to do something different. It couldn’t just be a rifle that I built; it would have to be something special. I have a revolver design in my mind, but I haven’t actually started creating it. We do have a 12-gauge shotgun coming soon, but I didn’t want to go crazy and build everything out there. I want to do a piece and do it perfectly before I move on to other projects. If you have too many projects going, then you don’t do each one as well as you would if you are focused on just one. DB What is your favorite firearm? JJ My first favorite would be my dad’s M1 Garand. I used to shoot that when I was a kid. My other favorite is a 1911 Commander, chambered in 9mm, that I built for a customer. I knew this guy was really into firearms and I felt a lot of pressure building the gun for him. I checked it four times before I let it leave the shop, and what is funny, when my customer received it, the first thing he did was take the whole thing apart on his coffee table and looked at every piece. Once he shot it, that was when I got the final thumbs up. I really liked that gun and it is probably my favorite so far. DB Why would someone buy your firearm over all the other options out there? JJ They are very smooth to shoot. The first time I shot a Colt Commander, it hurt my hand. I used to think that Kimber or Les Baer 1911s were really nice, until I made my own. You also have to remember that the amount of time and attention to detail, where no expense is too high and no amount of time is too long, makes my firearms so precise and smooth. That level of detail costs a lot more. DB Do you machine all of the parts for your firearms? JJ No, not every part. If I averaged it, I would say about 80 percent of each firearm is actually machined in house. Some parts, like the thumb safety on the 1911, I don’t make those. That just doesn’t seem like an interesting part to make, so I work with STI International. They have an amazing facility and are very close to my shop. I also work with Magpul for some of the furniture on our rifles, but we do make our own lightweight grips and aluminum buttstocks. DB What do you have to say to people who have expressed negative comments towards your products? JJ I have found that the people making those comments have never held or fired any of my firearms. I would put more value into their comments if I knew it came from first-hand experience. DB Tell me about your suppressor. It’s beautiful and clearly a designed piece, but why would someone choose yours over another? JJ It seemed natural to make my own because I have so much turbo-manifold exhaust knowledge; it didn’t make any sense not to. Many of the suppressors you see out there are based on the Hiram Maxim theory and that concept is like air hitting a brick wall. In short, my suppressor works similar to an air-brake system, which is more efficient, and in my opinion, simply works better. Dave Wilson is an amazing freelance photographer and was kind enough to work with me during the Jesse James interview. He painstakingly created the images I wanted to portray to the readers; the workshop, the atmosphere, the products. I wanted you to feel like you were actually there and Dave did a great job. Originally from Scotland, Dave lives near Dripping Springs, Texas. Dave uses new imaging techniques created by digital workflow. Many of these techniques blend multiple exposures to render a single image, which would be impossible to create using conventional, single-exposure methods. This form of processing allows deep shadow and bright detail to be captured while accentuating texture, detail and the play of light over the subject. This results in an appealing yet intangibly different atmosphere to his images. You can visit his website at davewilsonphotography.com. 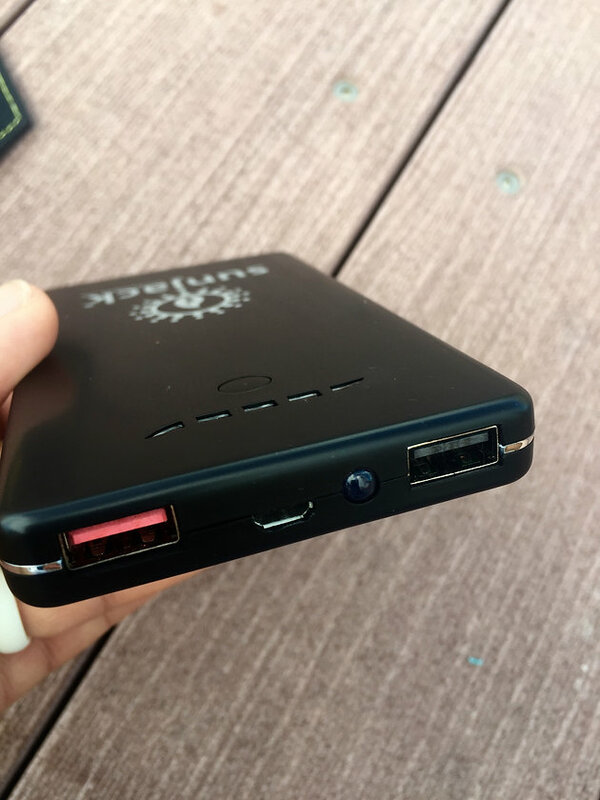 [su_dropcap style=”light” size=”5″]S[/su_dropcap]olar chargers and gadgets that run on solar can be found all over the place, and like many I have tried almost all of them disappoint. Some never fully charge, lose their charge too quickly, fall apart, short out if they get wet or any number of things that render it useless after just a couple tries. These are all the reasons I fell in love with Sunjack. My first impression of the Sunjack after taking it out of the package was wow! 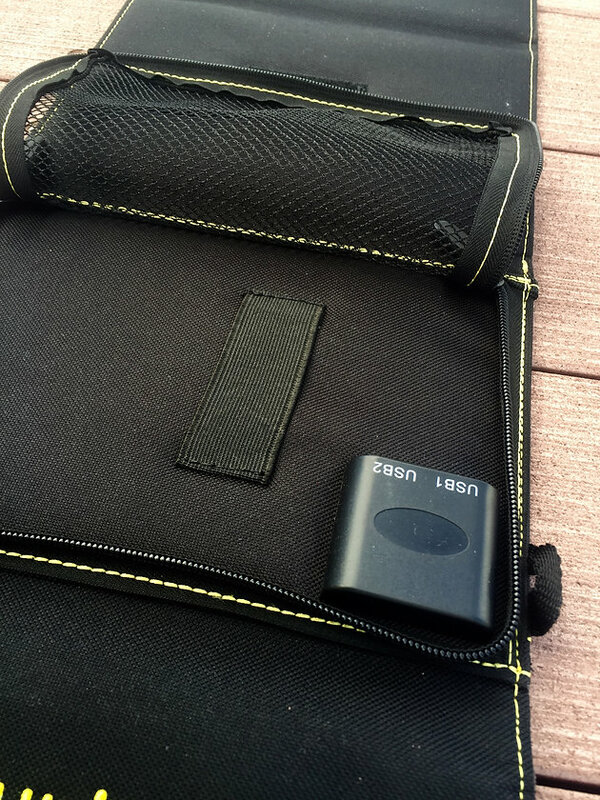 The quality of the case, stitching and construction was exceptional – good sign. 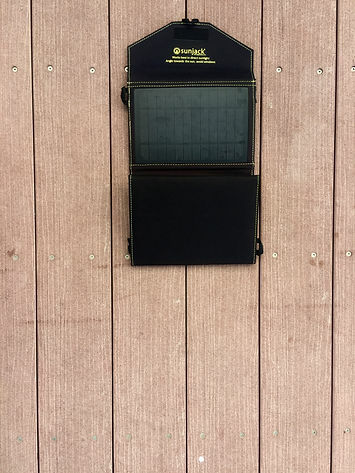 Then I expanded the case and was impressed to find four full solar panels. Surprising for such a thin case, but the test was yet to come, and test it I would. The Sunjack was clearly designed by those who need and use these devices. 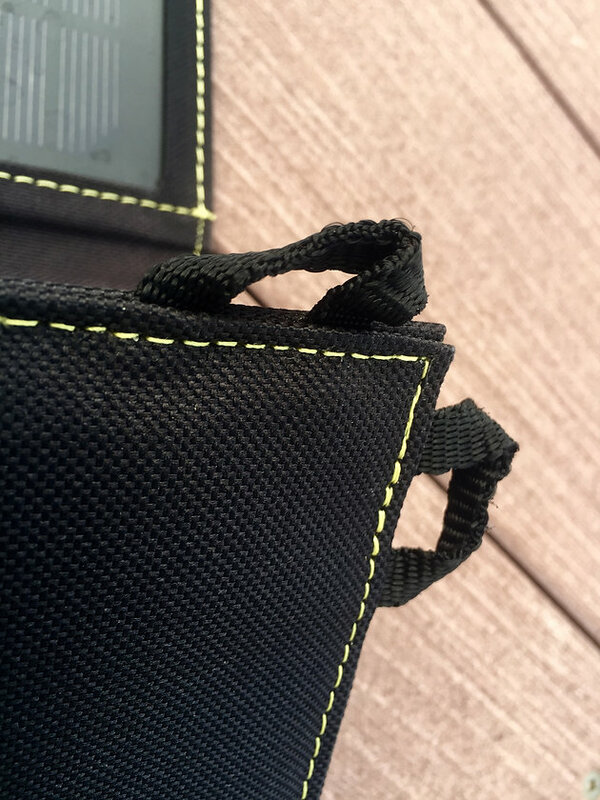 It comes with a carabiner and multiple attachment points around the case, so that you can hang, attach, suspend and clip onto almost anything and any angle. Nice touch. 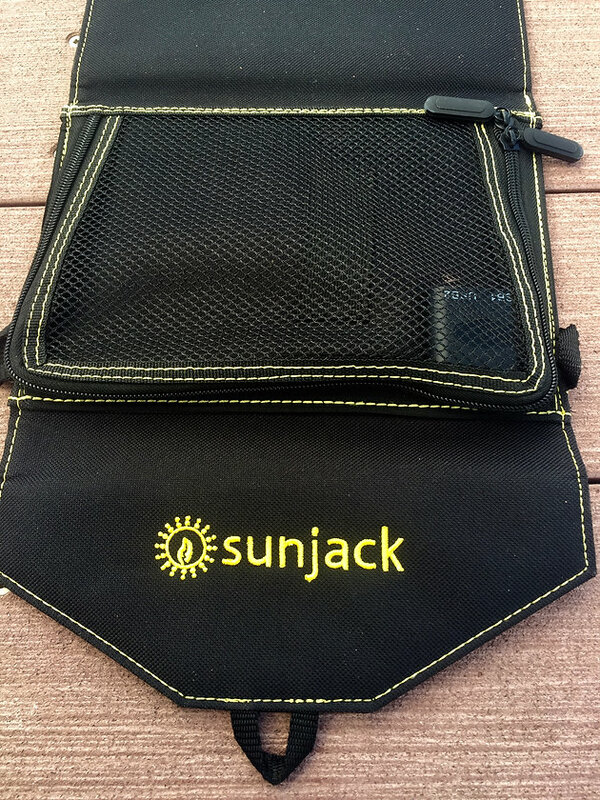 On the back of the case – non solar-panel side – there is a mesh compartment which neatly stores the Sunjack portable battery (more on that in a minute) and cable as well as the solar plug-in with dual USB ports. This is actually attached to the case, so you cannot lose it. I would lose it. 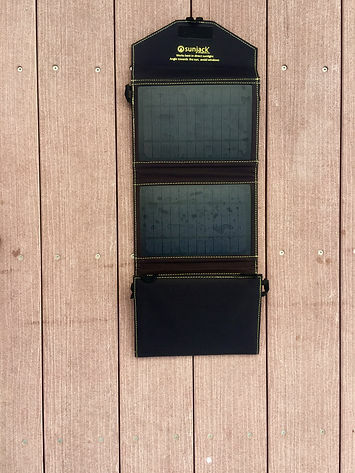 Some solar chargers only offer the ability to either charge a portable battery or charge directly to a device – not both. Sunjack offers both. Let the testing begin – Mwahahhahaa! I can be pretty tough on things, so I expect my gear to take a beating. 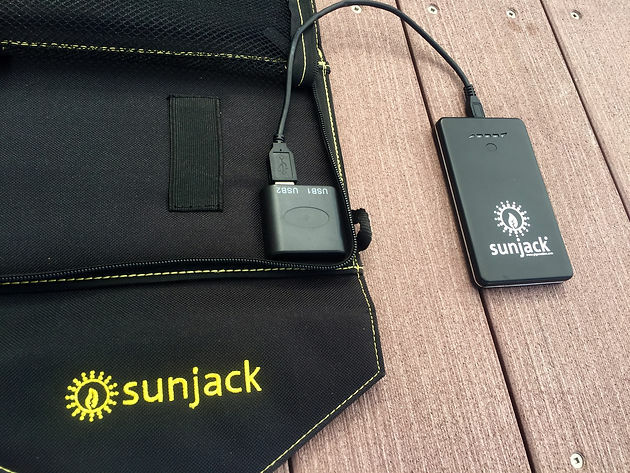 I put the Sunjack through some pretty impressive paces to include purposely leaving it out in the rain, dropping it and the battery pack numerous times and basically using it as it was intended – to provide power for the earth-wandering explorer/survivor. Almost to my dismay, it continued to work flawlessly. Using my iPhone 6 Plus, I ran down my battery to just five percent and plugged it directly into the solar charger. It took about three hours to fully charge my phone. It also charged my Ipad in about 3.2 hours from a 10 percent starting point. Charging the battery pack that was included with the kit took about two full hours. Not a bad rate of charge considering the time it took to charge a phone and tablet. This is where this little device excels. Charging directly from the already charged battery pack, I was able to charge my iPhone from eight percent to fully charged in 32 minutes … twice! On a single battery pack. This means that if I left my house with a fully charged Iphone and battery pack, I could get three full iPhone-battery cycles without plugging into a wall – SOLD! No other solar charger or solar battery pack has ever provided this kind of speed, and the battery pack is tiny – about the size of a standard iPhone. Another great feature is the battery-pack charging port. 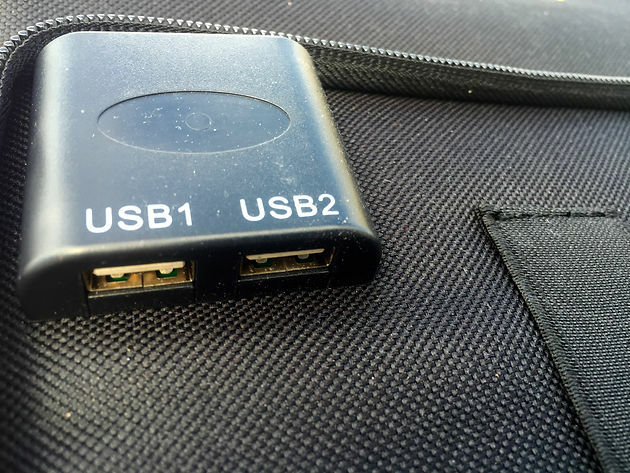 Because the port is not one of the two USBs on the pack, you can charge the battery pack and an iPhone simultaneously. I love this little device, and am happy someone in the solar world finally got it right. Thanks, Sunjack. Raul Hernandez, a former K9 sergeant with a major US law enforcement agency, is the lead trainer for FTI K9. [su_dropcap style=”light” size=”5″]W[/su_dropcap]orking dogs come in all shapes and sizes, but it is often the image of a German shepherd or Belgium Malanois that comes to mind when we think of K9s in law enforcement or military applications. Many dogs beneﬁt from having jobs, and certainly these breeds are at the top of the list, but they also readily bridge the gap between a home invasion and an invasion by a 3-year-old when properly trained and socialized. FTI K9, a division of the Force Training Institute located in north-central Florida, is redeﬁning personal-protection dogs by selecting European-born German shepherds – carefully chosen from a network of the ﬁnest kennels in Germany, the Czech Republic, Slovakia, the Netherlands and Austria – from elite bloodlines and tailoring their training. They use modern, reality-based methods backed by positive reinforcement, and speciﬁcally target shepherds with high intelligence and courage. What is also important to FTI is that the dogs must demonstrate an admirable temperament and dependability. These key traits can be the perfect base for a companion that is truly the family’s best friend and eager protector. FTI only selects shepherds from the finest bloodlines and looks for qualities such as intelligence, courage and dependability. RAUL HERNANDEZ, a former K9 sergeant with a major US law enforcement agency, is the lead trainer for FTI K9. Hernandez is certiﬁed with Delta Society Pet Partners program and the Florida Department of Law Enforcement. He is also an instructor in law enforcement high-liability training, including defensive tactics. With over 30 years of experience working with canines, he has a worldwide reputation as one of the top importers, breeders and trainers of quality European German shepherds. Some dogs are inspired by food, others by a ball or toy. Working with a dog’s preference will make it a more eager participant. All of FTI’s dogs are hand-selected in Europe from Germany, the Czech Republic, Slovakia, the Netherlands and Austria. THE 32-ACRE FACILITY runs these dogs through all sorts of scenario training that mimics real life events. They are put through rigorous exercises that include agility, family protection, law enforcement and military applications, sport and obedience. They also use bustling Florida cities like Ocala, Gainesville and Orlando, which are often ﬁlled with tourists and high-energy activity, to acclimate them even further. Hernandez says that the physical aspect of a working dog is very important, but equally important, if not more so, is that their dogs must be loyal and trustworthy to the core for the families they will join and protect. Hernandez says that positive reinforcement is key during training, and they ensure all of the dogs have fun and enjoy working with their handlers. They praise the dogs with food or a ball, depending on the dog’s motivational preference, and ensure they’re well socialized with people and taught manners so that they can seamlessly work in homes, oﬃces, warehouses – even yachts. The 32-acre FTI training facility runs these dogs through scenarios that mimic real-life events. Some of the most elite K9’s graduate from the Force Training Institute in Florida. Editor’s note: For more info on FTI K9, you can visit them at ftik9.com. [su_dropcap style=”light” size=”5″]T[/su_dropcap]he American Shooting Journal sat down with Tony Hook, owner and founder of New Hampshire’s RTD Manufacturing, who shared how he went from ﬁxing cars for a living to manufacturing guns, as well as the trials and tribulations of what it takes to start, own and operate such a company, one that prides itself on extremely low tolerances. When Hook began, his biggest hurdle was sourcing the few parts he could not manufacture himself. The main problem was the level of quality he insisted on for his guns. American Shooting Journal How did RTD Arms get started? Tony Hook It was started due to a question my 14-year-old stepson Robby asked. I had just purchased a brand-new AR-15 made by one of the more recognizable manufacturers. I brought it home and took it apart while he was watching. I found that most of the parts inside were very poor quality, and the upper and lower receivers did not ﬁt well. After using a few words I should not have used in front of a 14-year-old, he asked me if I could build a better one. I thought about it for a minute and said, “Yes!” Then he asked if I could make money making guns. I think my response was, “Maybe,” and that I would have to look into it. ASJ Where did the name RTD come from? Eighty-five percent of all RTD guns are made in New Hampshire; the company’s plant is based just west of Manchester. and Tucker, and they were dubbed the R and T of RTD. But that was not the end of the story. One day, I was teaching an armorers course on one of our pistol platforms and a retired Army captain stepped up, slapped me on the back and said, “What a great name for a ﬁrearms company – Ready To Deploy!” So, with a straight face, I thanked him and RTD has been Ready To Deploy ever since. ASJ What a metamorphosis! Now that we know where the inspiration came from, what drove the passion to jump through all the hoops it took to get a gun-manufacturing business up and running? Much of Hook’s inspiration to create a fine rifle was his feeling that many massproduced AR-platform rifles – even wellknown brands – are simply poorly made. build a riﬂe better than what I was ﬁnding on the shelf excited me. ASJ How long have you been in business? TH We have been in business since 2012, and a licensed manufacturer since 2013. ASJ What is your background? TH My background is mostly in the automotive industry. I’ve made most of my living either owning a shop or running someone else’s for years. I tried to escape the auto-repair world and got into machine and tool, welding and even insurance, but these jobs always pulled me back in until now. ASJ Tell us more about your family. TH I have a great family, both immediate and extended, and most of them shoot but all of them are supportive. I lost my ﬁrst wife to cancer at a very young age before we had any children, so I do not have any children of my own. However, I do have three stepkids that anyone would be proud to call their own. They have one heck of a mom, Debbie, who did an awesome job bringing them up. The oldest is Maria, who just got her doctorate and is taking her board exams to become a pediatric physical therapist this month. When it comes to brains and beauty she gets very high marks, and she is a good shot when she can sneak in some range time. Next is Paige, the middle child and much more of a free spirit. Paige just graduated college and is now studying for her CPA. She is yet another smart and beautiful woman not to be reckoned with. I often say if you give Paige $10 and a Swiss army knife she could take over a small European country; she also enjoys going to the range and exposing her friends to shooting. Hook says his family has been hugely supportive of his move to manufacture firearms – a trek he started just a few years ago. Now, he produces some of the finest AR-platform rifles on the market. Show and needed more for Sunday. So, yes, I have family. ASJ What was the hardest hurdle when you started this company? TH Wow, there were a lot! For starters we had to get our FFL; to be honest, I thought that would be the hardest – it was not. The hardest aspect was ﬁnding quality manufacturers that could supply the parts we could not make ourselves. Most wanted huge quantity orders or big-dollar minimum orders that we were in no position ﬁnancially to pull oﬀ, so began plan B: ﬁnd local machine shops that had the equipment and tooling. Most were very receptive, and we have great relationships with all of them. They are also one of the main reasons that over 85 percent of an RTD ﬁrearm is made right in New Hampshire. ASJ What has been the best payoﬀ, in terms of realizing you made the right decision? TH I think what makes it all worthwhile is when a customer goes out of their way to come to me at a gun show or an event to thank me and let me know how much they love the gun we built for them, or that it is the best one they have ever owned. That lets me know that I am doing what I started out to do and did not lose sight of why I started. ASJ Do you compete in shooting sports? TH When I started RTD, I was an avid shooter competing in International Defensive Pistol Association (IDPA), Civilian Marksmanship Program (CMP), F-class long range and local pin shoots. I even did a little 3-Gun competition, but nowadays the only trigger time I get is test ﬁring. I hope 120 to get to a place where I can enjoy the fruits of my labor and get back to more competitive and recreational shooting. Hook hopes to have his RTD RT-10s and other products on the shelves of at least 100 gun dealers and distributors by the end of 2016. ASJ What are your business goals at this point or the next milestone, shall we say? TH The biggest business goal at this time is branding. I know there is a lot of competition in the AR-platform market and we are working very hard to put our stamp on it. This goes hand-inhand with the next milestone and that is to have our riﬂes available in no less than 100 gun retailers and distributors by the end of 2016. As far as growth, I feel it needs to happen naturally. My greatest fear is growing too big too fast and compromising the quality of our ﬁrearms, which I won’t do. Another big item on my goal chart is a 1911 pistol, and if all goes well it should debut in late 2016 or early 2017. ASJ What are you most excited by right now? TH We just went into production with our new riﬂe and AR pistol featuring a side-charging upper. It is our ﬁrst departure from mil-spec and I am very excited about it. I believe it ﬁlls a need for several diﬀerent applications and is not just novelty. The side-charging upper ensures the shooter does not have to reposition their gun to lock and load, and my favorite beneﬁt is it oﬀers an opportunity for shooters with a weak hand possibly due to arthritis, handicap or injury to be able to enjoy and operate an AR-platform ﬁrearm. ASJ Do you support any charities? TH Yes I do, both personally and through my business. I support the Susan G. Komen foundation and their ﬁght against breast cancer, which is how I lost my ﬁrst wife, and I also support the ASPCA and some local animal shelters in the area. ASJ What is your personal motto or creed? TH Live free or die trying. As an avid shooting competitor who’d just purchased a subpar AR-15, Tony Hook was challenged to build a better rifle – he did and launched RTD Manufacturing. ASJ Thank you very much for taking the time to talk to us, Tony, and the American Shooting Journal and our readers would also like to extend a huge thank you for your generosity in donating one of your beautiful RT-10 riﬂes for last January’s SHOT Show raﬄe and this month’s NRA show raﬄe. Another lucky reader will soon be the new owner of an exceptional piece of workmanship. [su_dropcap style=”flat” size=”5″]D[/su_dropcap]ear readers of the American Shooting Journal: I come to you this month with hat in hand, shoulders slumped and a defeated look upon my face. I might even have been seen kicking a can. Last month we featured an article titled Get The 4-1-1 on Rule 41F on the new changes to the gun-trust laws. I was so excited to have this story and get it out to you that I overlooked a very important detail. One could say that the job of an editor is to ensure that punctuation and spelling are perfect. One might say we are fact checkers. One could go so far as to suggest that a basic working knowledge of the English alphabet would play into the job somehow. Ahem, this is where I failed. The cover of the March 2016 issue of American Shooting Journal says Get the 4-1-1 on Rule 41B. Clearly this is off by four letters. I could insert a number of excuses such as my cat ate my notes or I was shooting low and left, but it does not change the glaring fact that the cover of a national gun publication is out of its mind. So, for all the folks out there who’ve been scouring the Internet or making inquiries and wondering what on earth Rule 41B is, my friends, I am sorry. 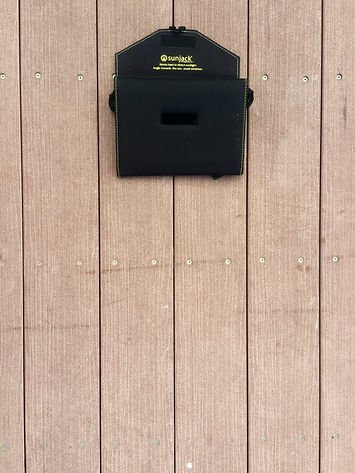 If you do find out what it is, please let us know so we can provide the 4-1-1 on Rule 41B. In the meanwhile, you will just have to suffice with background on Rule 41F – which is brilliantly written, I might add, and by a highly skilled attorney who is clearly more accurate than I am [drops microphone and shuffles off stage]. There are thousands of security contractors operating in high-threat environments and within that group there are a handful of women. They sport the same body armor and equipment, have to uphold the same physical requirements and are expected, by their male peers, to do the exact same work – protect people from danger, up to and including losing their own life. On the subject of whether women should be in elite military forces, the jury is still out; however females in high-level close protection who cover a range of clients from foreign dignitaries and ambassadors to government and corporate employees and their international guests are holding their own. They are widely accepted within the elite cadre of close-protection specialists and have a significant role to play. The average current ratio is one woman to one hundred men, but it is growing. Women in high-threat security is not a myth, and they can be found in some of the most austere environments. They are expected to protect their charges with the same strength, stamina and tactical capabilities as their male counterparts. In high-threat protection, the primary role is to avoid conflict. This requires a thinking approach. Forethought, flexibility, contingency planning and the ability to seamlessly make changes on the move are paramount. One cannot passively wait for an event to occur and then try to come up with a solution – not well, anyway. This proactive form of protection is all in the training and preparation. Male or female, everyone must be on constant alert and in top physical condition. While there aren’t many women in these roles, they are around and they are awesome in their own right. You’ll find an array of backgrounds as equally diverse as with the men. What sets these women apart is obvious: they stand out in the crowd amongst their peers; they don’t blindly follow expectations; and have taken their own paths. This alone says a great deal for the personality, composure and perseverance of the ladies in these roles. The experiences, traumas and tribulations a team will go through together, bonds them. People who have been in the military or high-stress situations together are very familiar with this connection. Areas such as Kuwait are still considered high-threat areas although this country has stabilized considerably since the Gulf War. While high-threat protection is its own category of security, and is often titled as such based on the austere locations and level of threat in an area, there are many other possibilities where women can and do excel in protective security roles. Positions such as executive and family protection are at the top of the list, especially for clients looking for a low-profile signature. Most executives and dignitaries comport themselves in a low-key, quiet manner and prefer to remain under the radar. In contrast, these people differ from, say, music celebrities, whose requirement is to be seen and recognized, as well as protected. The protection professional in this case is up front, easily identifiable, often physically large and may even wear a shirt that says security. The term ‘high-threat’ is an allocation for areas in the world set by the United States. This designation determines all sorts of factors from the type of gear one might be issued, to protocol and even pay rate. Protection is not only about physical protection, but also about avoiding unpleasant issues or any number of troubling matters one can encounter throughout the day. Women can offer not only a security element, but the appearance of an assistant or administrator who can blend easily into the background, allowing for an excellent vantage point to watch over the client. Oftentimes, women readily offer the ability to deftly mitigate a negative situation simply via, potentially, a naturally disarming presence. High-income families commonly need a discrete signature. A large male bodybuilder-type following a woman and her children around may not be desirable. In this instance it would be much easier for a woman the blend in. Often when considering protective personnel, the preference is that the candidate comes from either a law-enforcement or military background; however that isn’t always necessary. There are quite a few reputable companies, like Gavin de Becker or government agencies such as the US State Department and Department of Homeland Security that train and hire their own candidates. This is not a comprehensive list and research on your own will open up all sorts of possibilities. Major corporations, the entertainment industry, government subcontractors and the United Nations usually require previous and extensive background in protective services, which can be obtained by some of the examples above, but there are schools specifically designed to certify people for personal protection. The level of threat will dictate the requirement. I have been in protective security and dispatched to numerous locations in the Middle East, Southwest Asia and South America over the last 14 years. My initial background was founded in law enforcement where I was on a SWAT team. In each location I worked with all facets of former military personnel to include Special Forces, Army Rangers, Navy SEALS, Marine Recon and others. Once integrated into a team, I found that teamates, after their initial discomfort, accept me as one of their own. I have always taken this as the ultimate compliment. I also made a point to never complain, make sure I was squared away and helped anyone I could. As the designated M249 SAW gunner, I was expected to handle, keep and maintain the SAW along with my other weapons. There is no special treatment for women in high threat nor should there be. A teammate once told me a story of his wife’s jealous reaction when she saw a photo of his team in Baghdad. She noticed and was upset that there was a female amongst the men. My colleague, immediately confused, asked “Where?” When his wife pointed at my image, he laughed and said, “That’s not a girl, that’s Dani, she doesn’t count.” I saw this comment as his acceptance of me in the team. I have always been proud of working with these men and have remained bonded buddies with almost all of them over the years. Once a capable woman has established herself within a team that functions cohesively, the gender lines blur. complete honesty, I tend to judge females coming into these roles possibly more harshly than men do. The last thing I want is the wrong type of woman stepping into these roles with their high mental and physical requirements. A female, or anyone for that matter, who cannot handle critical-thinking situations, is a whiner, cannot tough it out and make the mission work by putting aside their needs for the benefit of the team does not deserve to be there, in my opinion. Women are expected to be a burden to these teams, therefore, it is imperative that they aren’t. I am proud to say that I was the first female qualified as a tactical commander on a world-renowned high-threat contract and followed it up by becoming the first female shift leader to lead a team of men on a high-threat contract. I have no tolerance for someone who plays in a role they are not qualified to handle. That may sound harsh, but I feel that any woman who works in these positions needs to be a role model to their team and future women. Gear, clothing, weapon options and appearance can change daily depending on the client, the venue and the mission.